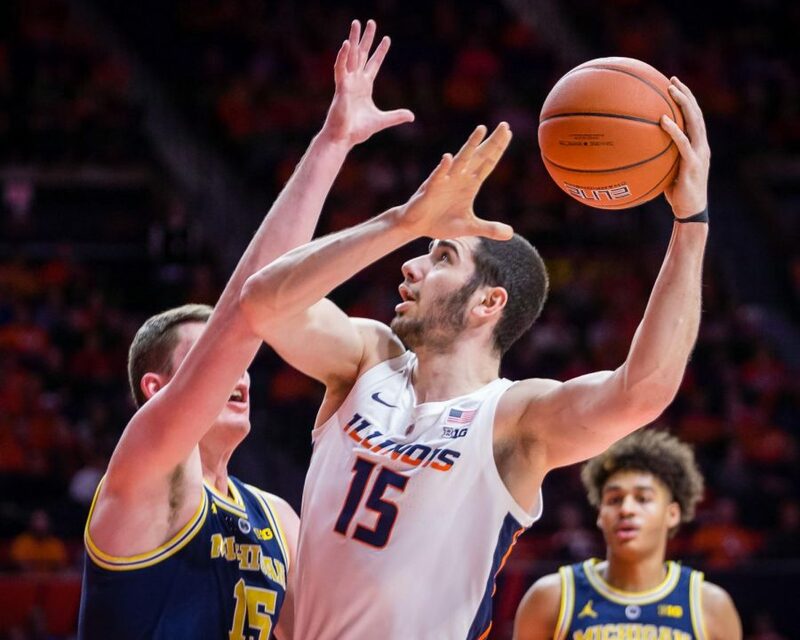 Illinois forward Giorgi Bezhanishvili looks to shoot the ball during the game against Michigan at the State Farm Center on Thursday. 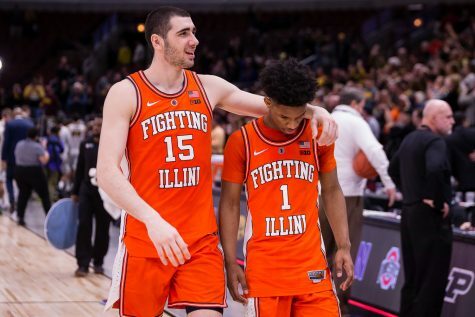 The Illini lost 79-69. 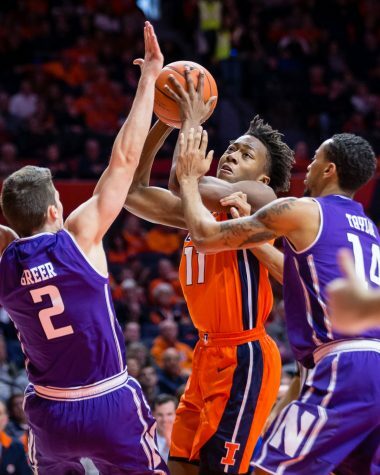 Returning home after a devastating road loss at Iowa, Illinois men’s basketball looks to collect a much-needed home win over Wisconsin to improve on a 5-13 season. The Badgers are currently on their longest streak in history with 13 straight wins over the Illini. The last time Illinois was victorious over Wisconsin was in 2011 after a close 69-61 battle. 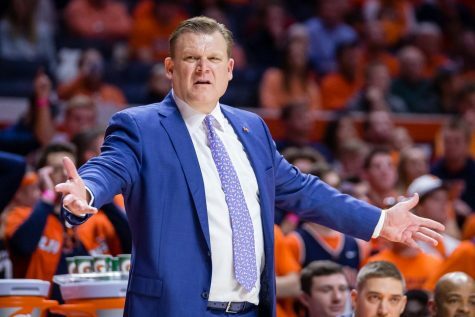 “If you don’t show up mentally, then you are going to lose,” said head coach Brad Underwood during his Wednesday press conference. The two teams take the court with two relatively opposite styles of play. Illinois ranks second in the conference forcing a 21.7 turnover rate, but the Wisconsin offense excels at keeping the ball. It’s no secret the more youthful half of the team has been excelling. 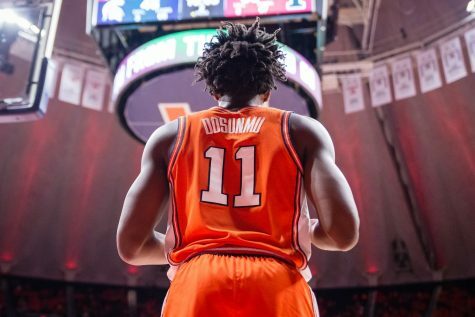 Freshman Ayo Dosunmu has been the Illini’s leading scorer in each of the last six games, averaging 20 points (120) on 54.5 percent shooting (55-101) and 43.6 percent on 3-pointers (17-39), with four 20-point outings. 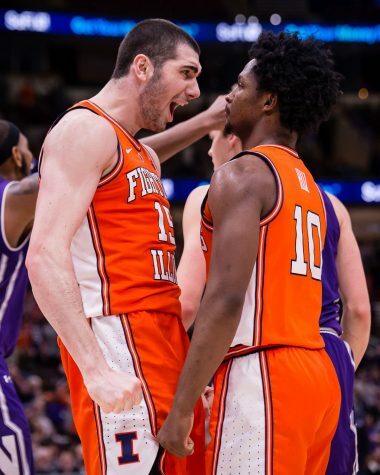 Fellow explosive freshman Giorgi Bezhanishvili’s averaging 14.4 points (72) and 5.8 rebounds (29) on 60.8 percent shooting (31-51) over the last five games, scoring at least 15 points three times. 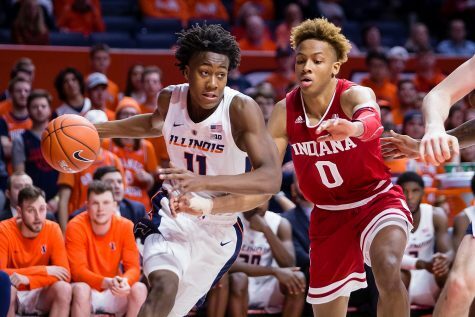 Other freshmen like Tevian Jones and Alan Griffin are also beginning to see more playing time, and according to Underwood, he’s still waiting for them to get more familiar and more comfortable before thrusting them into bigger roles. Bezhanishvili may have one of the toughest tasks of the evening matching up with big man Badger star Ethan Happ. Underwood’s best advice is to the breakout freshman: stay out of foul trouble. “You have to do your work early with Ethan,” Underwood said. “It’s really easy to say ‘don’t let him get to his spots,’ but his spot is anywhere on the court. Happ is the only player in the nation who averages 17.0 points, 10.0 rebounds and 4.0 assists per game. 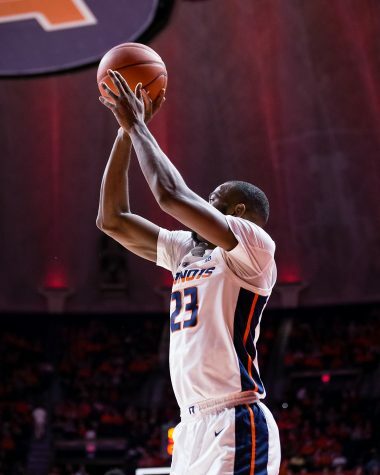 The versatile player was the biggest threat to the Illini last season and remains in that role this year as well. While the younger guys continue to shine, some of the older players have hit a plateau. Junior Kipper Nichols has seen possibly the roughest season, now with back-to-back scoreless games. 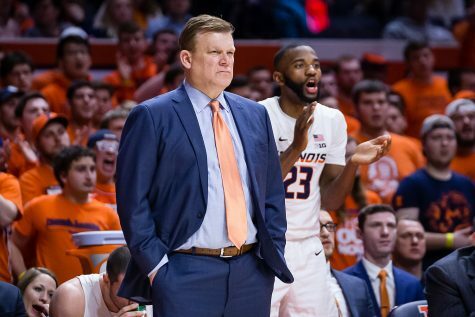 Underwood and his staff will be joining coaches across the country in wearing Nikes on the State Farm Center sidelines during Wednesday’s game. The team is trading in their dress shoes for the annual Coaches vs. Cancer Suits & Sneakers Week. Coaches vs. Cancer is a collaboration between the American Cancer Society and National Association of Basketball Coaches. The program empowers coaches, their teams and communities to join the fight against cancer by participating in awareness efforts, advocacy programs and fundraising activities. Since the Coaches vs. Cancer program began in 1993, college and high school coaches have raised more than $115 million for the fight against cancer. 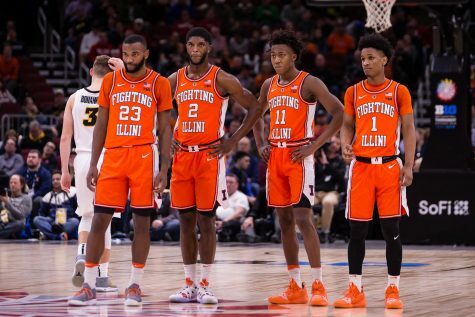 This game also serves a rather significant purpose because Illinois will recognize the 30th anniversary of the 1988-89 Flyin’ Illini team’s Final Four run. The Illinois Athletics department is giving away bobbleheads of the notable squad at various home games. Lowell Hamilton is the honoree of Wednesday night’s game. Hamilton was ranked fourth on the team for scoring his senior season at Illinois in 1988 with 13.9 points per game and second in rebounding with 5.7 rebounds per game. 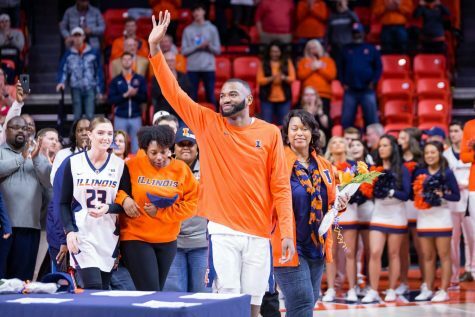 Hamilton still ranks 29th on the Illinois all-time scoring list with 1,241 career points.